Sawda Ghevra is divided in three parts: Phase 1, Phase 2 and Phase 3. Phase 3 is 4 years old, Phase 2 is 2 years old and no one has been resettled in Phase 3 yet. Photo mHS. Sawda Ghevra residents are not allowed to use their plot to open businesses (although this cannot possibly be enforced). Plots are either 12.5 sqm or 18 sqm and can only go as high as ground + 2.5. Photo mHS. From managing displaced people during Delhi’s biggest urban resettlement program – the partition of the Indian subcontinent in 1947- to routinely displacing its workers and citizens in the name of beautification, development projects or pure spectacle, India’s capital city has a poor track record of humane urban administration. However rather than integrating them into the fabric of the larger neighbourhood and improving civic amenities, most urban administrations see them as squatters who must be eliminated from the surroundings to make way for larger projects. Add to this is the exploitation of civic insecurities of these residents by politicians – who present these resettlement projects as if they are grand gestures of charity or favours when in reality it puts the residents into greater nets of insecurity – the most obvious one being the fracture of their living and working environments. The Sawda-Ghevra resettlement colony was carved out of mustard and wheat fields on the border of Delhi and Haryana. The farmers sold off fields at rates they were dissatisfied with. The quality of water below the sold fields was highly saline and undrinkable and the tiny plots carved out for each family was the site of much despair in the early days of their relocation. Several families speak about battalions of policemen and women who came with official eviction notices and sent them off packing in the middle of what was then nowhere. Sometimes in the middle of the harshest of winter and cold rain and with literally nothing covering their heads. Over time each family built a tiny home brick by brick against a frenzy of constant speculation of their deeds, sales and resale’s, bartering off tiny shares of profits, controlled by local land-controlling leaders. Those who eventually remained behind started to make a neighbourhood against all odds. With literally nothing around them except for fields which they had no access to, they brought with them their skills and resources and created a mirror image of the urban village that they used to occupy. The ‘rural city’ that thus emerged had shops and services that largely bartered with each other and over some time they began to connect with regions and neighbourhoods around to create a semblance of an economic map, which they could plug into. 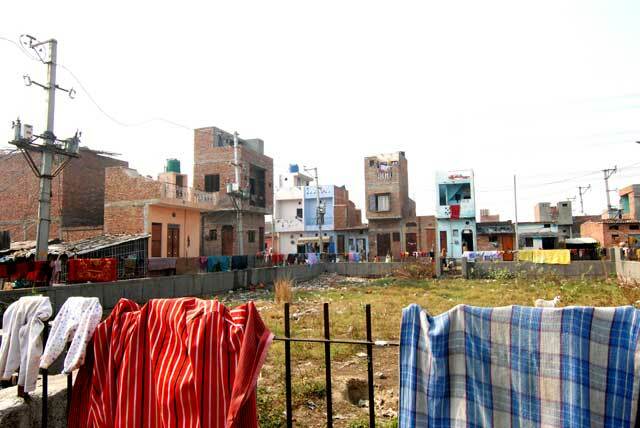 Sawda-Ghevra repeats a story that has happened in several neighbourhoods all over Delhi when they were in the periphery of the city on cheap land. Mongolpuri and Sultanpuri are some examples. Now very much within the main urban fabric these neighbourhoods in some way represent the future of Sawda-Ghevra. Since the resettled people are one of the most industrious and hardworking components of the population they regenerated those neighbourhoods by infusing them with economic energy and one can see that pattern emerging in locality after locality over the years. We were invited by our friends Rakhi and Marco of Micro Home Solutions (mHS), a very interesting multidisciplinary social enterprise start-up in Delhi that has done much work in the resettlement colonies of Mangolpuri and Sultanpuri and who are on their way to starting work in Sawda-Ghevra too. Their attempt is to help residents rebuild their homes into structurally sound low-rise, high-density structures for each family plot so that they could expand their economic bandwidth through rentals, retail or manufacture in the additional spaces generated. They explicitly keep a distance from an NGO approach of charity or indirect market transactions and work with a sensitive professional mindset through which they partner with finance institutions who give loans to each house client, while micro home solutions itself provides technical assistance and ground level support. mHS works with local masons and is genuinely interested in intervening in a sustainable manner and establishing long-term relationships with the localities in which they work. We felt that given the existing scenario in places like Sawda-Ghevra, interventions such as these are creative ways of helping regenerate such neighbourhoods. Especially when they grow roots and engage with issues of livelihoods. Home improvement projects, done outside the framework of pure charity, and with a socio-economic objective in mind can repair some of the violence that has been wired into their history. 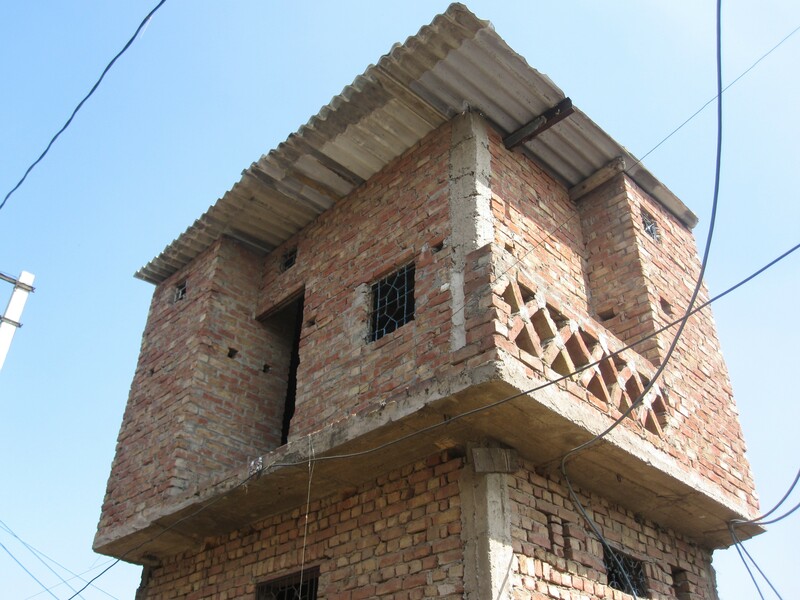 One aspect of mHS work that we appreciate the most is that they do provide a very concrete and viable alternative to the construction of mass housing for the poor, which as we have seen in Mumbai are environmentally and economically unsustainable. By dislocating the place of life and work, SRA type redevelopment projects, which are so typical in Mumbai put a great stress on the transport infrastructure as they produce more commuters. Micro homes, which integrate spaces of work and are well connected to the street economy seem to be far more viable on the longer run at all levels. 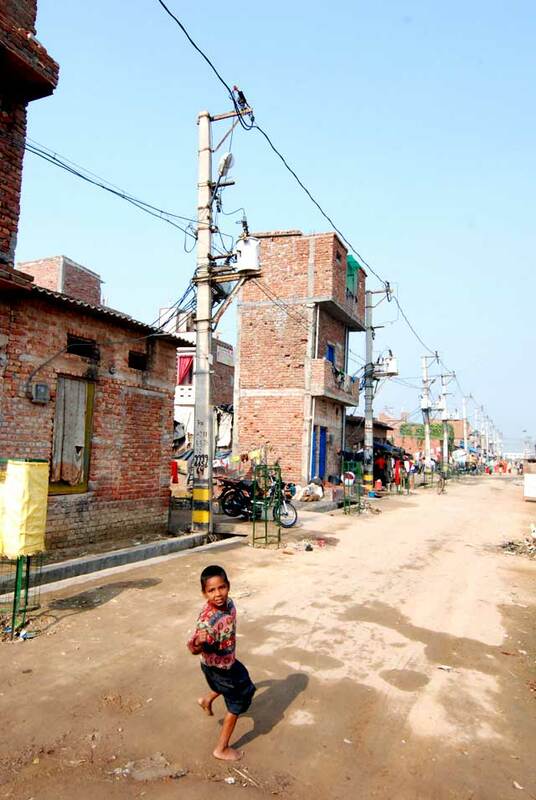 Sawda-Ghevra, a resettlement colony for erstwhile jhuggi-jhopdi (poor home) residents from an assortment of neighbourhoods in Delhi, is a story that has been documented and commented upon for several years now. It is a well-known fact that every Indian city depends on neighbourhoods of poor workers to provide cheap services and goods to middle-class residents, for economic production and street-based retailing. The live-work economy of these settlements manages to keep costs down by reducing commuting expenses.